These diviners are smart. They know that learning the meanings of the symbols on Tarot cards (in particular, the Rider Waite Smith deck) is one of the fastest ways they can go from beginner to pro reader. And let me tell you, if you’re learning symbolism there is no better place to invest your time than in animals. Animals are the most common groups of symbols you’ll see in every method of divination whether that’s Tarot cards, dreams, tea leafs, everything! On the throne of The King of Pentacles, there are bull symbols which probably represent the sign of Taurus. These reflect the fact that this King is determined, indulgent and a lover of all things beautiful, just like your typical Taurian. Other than the sign of Taurus, bulls are associated with sexuality. References to Greek myths are common in Tarot and the idea that bulls are symbols of sexual desire comes from the Greek myth of the Minotaur. The legend goes that King Minos asked for a sign of approval from the God Poseidon and was sent a white bull. Because the bull was so beautiful, he did not sacrifice it to the God, which angered Poseidon. As punishment, Poseidon made the king's wife, Pasiphaë, fall in love with the bull. She mated with the bull, got pregnant and eventually gave birth to the Minotaur, who was born half-man and half-bull. Therefore, because of the Minotaur myth bulls symbolize earthly pleasures. In Tarot, the King of Pentacles is the ultimate earth, grounded Court hence why there is a bull on this card. The cat on the Queen of Wands has always been a bit of a mystery. Cats are obviously associated with intuition and psychic ability, so you would probably be much more likely to see one on the Queen of Cups, not the Queen of Wands. However, think of it this way. All of the other grades in the Wands suit (Page, Knight and King) have the same attributes as the Queen. They are all energetic, enjoy hobbies, easily influence others etc. The difference is that the Queen has the feminine touch. Femininity is often linked with felines, hence the cat. The crayfish, type of crustacean, only pops up on The Moon Tarot card. Like all crustacean, they are associated with emotions, rivers, females and The Moon and therefore is a standard feature on moon-related art. Dogs are read differently depending on where you come from. For example, because I am a Romany Gypsy I read dogs to symbolize work. However, in the West dogs are read to represent friends, followers and confidants. But, in Tarot, dog symbolism is completely different. The dogs are used to reflect growth, animal instinct and even financial status. Take the dog on The Fool as an example. Much like The Fool, his dog appears wild, unkempt and not very tame. The lack of grooming on the Fool’s dog can also signal the The Fool’s poverty state; he doesn’t have much and is just starting out. The Fool dog is an extension of The Fool’s meaning. By the time we make our way to the 10 of Pentacles, the white dog, again, makes an appearance (this time there are two instead of one). However, in this instance the dog is controlled, tame, and has had its hair trimmed. The owners of these dogs can afford to take their pets to the groomers. The white dog has now became a symbol of the 10 of Pentacles’ meaning. The dog on The Fool is wild and untamed. By the time we get to The 10 of Pentacles, the dog is trimmed. The Fool can now afford to buy professional pet grooming! The fish can represent money, business and commerce. They also symbolize emotions and feelings, and this is especially true when fish appear in Tarot. Any animal which swims can usually be interpreted to represent emotions and feelings, because this is what water is generally aligned with. Therefore, as a general rule you can say that water creatures usually signal some type of emotion and you can generalize this to all water animals. In Tarot, it is common for the progression of a Court card suit to signal a development in maturity. The Page comes first because they are the most emotionally unstable and insecure. The King, however, while emotional finds a way to handle his feelings and not let them take over him. You will notice how the fish on the Page of Cups is in the forefront; this represent the fact that the Page is very upfront, almost uncontrolled with their emotions. By contrast the King of Cups’ fish is swimming about in the background; the King is able to hide his emotions and yet they are still there, bubbling under the surface. Of all the animals on Tarot cards, horses make the most frequent appearance. In divination, horses have very rich and detailed symbolic associations; Tarot is no acception. In Romany Gypsy culture, it is common for horses to represent friends, similar to how dogs do in gorger culture. Therefore, for me it makes sense that Knights are riding horses because I often interpret them as someone you may have a friendship with. However, I think that in the case of Tarot, the Knights’ horses are suppose to symbolize initiative and hard work, which is another common interpretation for a horse. Sometimes, horses can signal royalty and achievement. To own a horse is to have some level of wealth and status, and this is probably the reasoning behind the horses on the Sun and VI of Wands cards. Finally, there is a horse on the Death card. In contrast to the other horses, this one does not have a positive meaning; it is meant to represent one of the 4 horses of the apocalypse and is symbolic of death and destruction. The symbol of the lion on the Strength card is pretty obvious as lions symbolize mastery, honor and strength. Sometimes lions also signal important people. Also, the fact that the woman on the card is taming the lion and opening its mouth is a sign of control and the ability to conquer animal instincts, a common theme in Tarot. Many diviners mistake the creature on the King of Wands for being a generic lizard. However, it is actually a salamander - salamanders represent the element of fire. So, this one on the King of Wands is a node to the fact that Wands are associated with the element of fire in the Rider Waite Smith Tarot tradition. Salamanders are associated with fire because it used to be believed that they can fire walk. I am in two minds about the symbolism behind the Queen of Pentacles. It is possible that the furry creature could represent a rabbit, but it is also possible that it is a hare. It is popular European superstition that rabbits are good luck (especially their feet). Rabbits are especially associated with financial windfalls. In some ways, the Queen of Pentacles is very fortunate and lives a rather privileged life so no wonder there is a rabbit drawn on her card (if that is what the animal is). In divination and fortune-telling, rabbits are also linked with sexuality and fertility. One interpretation for the Queen of Pentacles, is that she represents motherhood and the female aspects of the physical world, hence the rabbit. Although the animal on the Queen of Pentacles is probably a rabbit, there is a chance that it is a hare, which I will explain more about under ‘tortoise’. The ram head appears on the throne of The Emperor, symbolizing the fact that this card is associated with the sign of Aries. It is pretty obvious that snakes represent temptation and sexuality, as most people are familiar with the story of the snake tempting Adam and Eve. In fact, both individuals and the snake make an appearance on the Lovers card. In the case of the Lovers Tarot card, the symbolism is self-explanatory. Many Tarot readers are confused, however, as to what the snake represents in one of the cups of the 7 of Cups. In this case, the snake symbolizes the same thing as it does in the Lovers card. The snake is in the cup, because sexuality and earthly pleasures are one of the choices which the figure can make, the others being money, beauty, spirituality and so on. A lot of readers have never noticed this, but there appears to be something the King of Pentacles has his foot on. Many people have speculated as to what this thing is, but I suspect that it might be a tortoise. Like the tortoise, the King of Pentacles is associated with achievements, wisdom and expertise. It is interesting to think that if the King of Pentacles features a tortoise, then what if the animal on the Queen of Pentacles is actually a hare? How does the card’s meanings change in that respect. If these animals are a tortoise and hare, then this can mean that the Queen symbolizes the quick thinking, opportunistic aspects of the suit. The Queen is more aggressive in going for what she wants, stark contrast to the other queens when compared to their king counterparts. If the King is standing on a tortoise then this means that he is the slow moving, wise and cunning Court of the Pentacles suit - an interpretation which fits in nicely with this card. Finally, we have a wolf figure on the Moon card. This wolf, appears with its dog counterpart. The wolf and the dog on the Moon Tarot cards are supposed to symbolize both human restraint and animal instincts. The dog is tamed, but the wolf is the wild, natural, intuitive thoughts and feelings we all have which are buried deep beneath the surface. The dog and the wolf on these cards are there to remind the seeker to use both intuition and common sense when making decisions. There is no clear-cut way with the Moon, no this and that. All choices must be made on their own merit, and dealt with individually at that particular time. There cannot be too much listening to the spirit or too much following to the mind. Both must work in harmony if the seeker wishes to achieve the best outcome. Well, that is it for the animal symbols of the Tarot. Remember to read all about the birds of Tarot, and the mythical creatures of Tarot. What do you animals on certain Tarot cards mean? What is the significance behind the animal symbolism of the Tarot? What are the Tarot card animal symbols and their meanings? I often get asked these questions by people who are first learning to read Tarot. 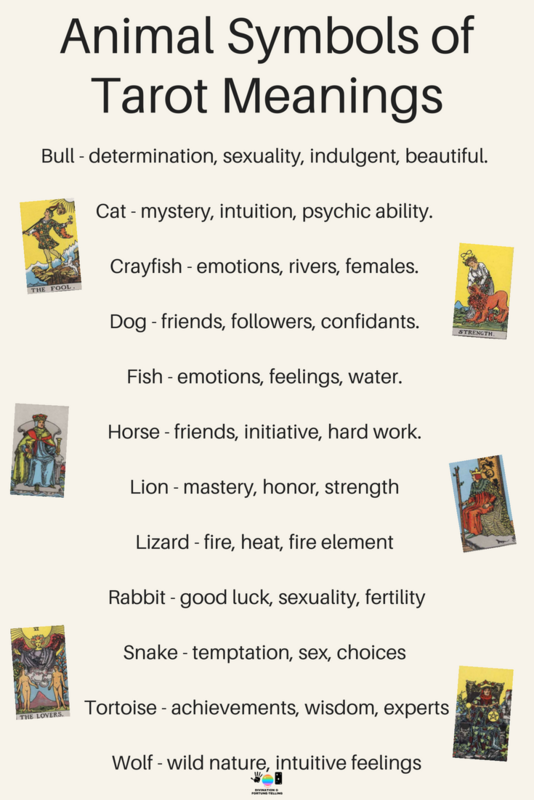 The Animal Symbol meanings of Tarot Rider Waite Smith Tarot cards for beginners who want to learn symbolism for divination and fortune telling. Includes meanings on the Major and Minor arcana.